First Response Personal Fire Suppression Unity for Home, Show, RV & Camping! Use to extinguish Class A and Class B fires. FireAde 2000 fire fighting agent is biodegradeable, environmentally safe and easy to use. Quickly extinguishes fires involving wood, paper, cloth, oil, gasoline, flammable liquids and grease. FireAde is ideal for extinguishing fires at home, auto, shop, and camping. Keeping a FireAde 2000 extinguisher nearby can save lives and property damage. Many fire departments, law enforcement officers and racing safety crews carry FireAde 2000 fire suppression unitys for quick, first response to small fires and flammable fuel spills, eliminating expensive clean-up and damage to property. Puts out small, developing household fires fast. Compact and lightweight, a familiar spray can package. Point-and-spray. No pins to unlock or levers to squeeze. Effective on paper, fabric, wood, cooking oil and electrical fires(Types A, B, C and K). Requires no shaking. 9.65 inches tall, 14 ounces. An internal pouch isolates the contents from the pressure. When the spray nozzle is pressed, only the contents are released and the propellant stays inside the can so the fire is not agitated. Sprays four times longer than household fire extinguishers. Contents are easy to clean up, biodegradable and nontoxic. Wipe the surface area clean with a damp cloth. Can be pointed from any orientation at a distance of three to four feet. Smoke alarm with test/silence button and insect screened, dual ionization sensing chamber. Input: 120 volt AC - 60 Hz, green LED power-on indicator, red LED to confirm unit is working properly, single test/silence button to check all alarm functions. Solid state piezo horn rated at 85 dB minimum at 10 feet, plug in connector capable of interconnection of up to 18 alarms, 12 of which can be smoke alarms. Meets the requirements of UL 217, CSFM, NFPA, NFPA 101, ICBO, BOCA, SBCCI and CABO. 10 year limited warranty. Use with ALC wireless security systems AHS612, 616. Install the peel-and-stick sensors by attaching to any door or window and frame. When system is armed, the two-piece sensor triggers an alert in the event of a breach. Sealed ionization battery smoke alarm. 3V Lithium power cell. Tamperproof design. Alarm status LED Indicator. End-of-life signal, test/silence button. 5" x 5" x 2". Wired-in 120 volt 60 Hz AC powered with 9 volt battery back-up, side load battery drawer and dust cover. Photoelectric smoke sensing chamber, 85dB horn, single button test/silence, green LED power light and a red LED light that indicates either unit is operating under DC power or is in alarm. Interconnectable with up to 18 devices, of which 12 can be smoke alarms. UL Listed. 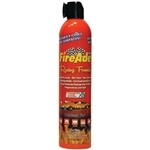 FireAde Racing Formula Extinguisher 22oz. No batteries required. 120 volt plug-in. With silence feature, samples the air and performs self-diagnostic tests approximately every second. A microchip inside the unit stores each reading, and remembers the levels of CO it has been exposed to over time. Controls are: test/silence button, green power light, yellow service light, red alarm light. Loud 85-decibel alarm, UL listed. 5 year limited warranty. 3.3" height x 4.75" width x 2" depth, 0.24 pounds. 22oz. Extinguishing Agent from FireAde is both a fire extinguisher and a cooling agent. FireAde is uniquw. It is non-toxic and non-corrosive. It contains zero hazardous chemicals, is biodegradable and encompasses only water-based and food-grade ingredients. In short, it's safe to use everywhere near pets, plants, and people. Made in USA Low profile compact round battery powered photoelectric smoke alarm with silence feature. Tamper resistant. Locks alarm to mounting bracket to prevent removal of battery and/or alarm. Powered by sealed, lithium batteries to provide continuous protection for ten years without battery replacement. Detects both flaming and smoldering fires. Flaming fires spread quickly. Smoldering fires burn long and can fill the home with smoke. Point and click with any remote control to quiet unwanted alarms. Smart sensor helps recognize the difference between non-threatening conditions and real emergencies. Easy access battery drawer. Loud 85db alarm. 2 AA batteries included. Meets UL217 standard. Use with ALC security systems AHS612, 616. Alert in the event of unauthorized movement within a 40 foot range. Notify an iOS or Android smartphone or tablet. State of the art smoke and CO combination alarm designed to provide early warning of a fire or carbon monoxide danger. Has a dual chamber ionization smoke sensor and an electrochemical CO sensor. Loud 85-decibel alarm, low battery warning. End of life alarm chirps when it is time to replace detector. Operates between 40F (4C) and 100 degreesF (38 degreesC) and relative humidity between 10 and 95 percent. Two latching features: alarm latch to easily identify initiating alarm after alarm condition has subsided and low battery latch: to visually identify which unit is in low battery condition. Intelligent Sensing Technology helps reduce the number of nuisance alarms. Includes dust cover, mounting anchors and screws. 9 volt alkaline battery included. 7 year warranty. Plug-in with battery back-up, works during power outages. Covers only one wall outlet. One button to silence or test alarm functions. Silence quiets low battery alert without affecting alarm operation. Loud 85-decibel alarm. Low battery warning. End of life timer alarm chirps when it is time to replace. Should be replaced every 5 years for maximum protection. 3.3" height x 4.75" width x 2" depth, 0.43 pounds. UL Listed. 5 year limited warranty. Uses 2 AA batteries, included. Control lamps, fans, radio or television from Apple iOS or Android devices. Plug items in to the power switch plug, program on/off schedules from smartphone or tablet. Use with ALC wireless security systems AHS612, 616. Wired-in, 120 volt AC, 60Hz single or multiple station heat alarm. 9 volt battery backup. Microprocessor controlled, thermistor heat sensor, features fixed rate and rate of rise temperature sensing that allows unit to alarm prior to reaching the fixed temperature setting of 135 degrees F. IR remote control silence/test uses most remote controls to temporarily quiet unwanted alarms and test alarm functions. Two silence features can silence the low-battery chirp for up to eight hours or temporarily silence a nuisance alarm. UL Listed. 10-year limited warranty.